Founded in USA in early 70s with the name "FULL CONTACT KARATE", the sport entered Europe in 1975/76 when WAKO (World All-Styles Karate Organization) was established in Germany. In 1978, the first World Championships ever was held in Berlin. In 1980, WAKO was obliged to change name to its sport to avoid confusion with original traditional karate. So KICKBOXING (synthesis of KICKING and BOXING) was the name chosen by the leaders of those days and WAKO started to stand for WORLD ASSOCIATION of KICKBOXING ORGANIZATIONS. Officially recognized by GAISF since 2006 and a member of WADA, today WAKO KICKBOXING is an umbrella name consisting of 7 styles of combat competitions, precisely: Semi Contact, Light Contact, Full Contact, Low-Kick, K1 Rules, Musical Forms and Aero-Kickboxing. WAKO conducts its activities in Asia through its Asian Kickboxing Federation coordinated by Wako Asian Continental Division. 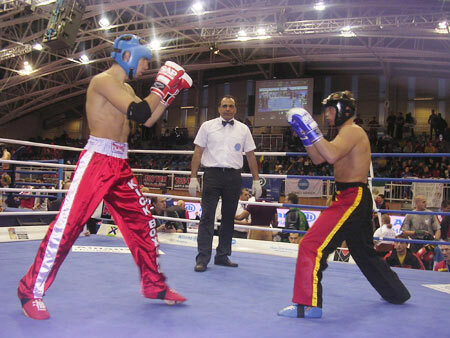 Wako Asian Kickboxing Federation was founded on 19 December 1996 in Bishkek (Kyrgyz Republic). Already practised by millions all over the world, KICKBOXING is still growing today steadily at everlasting speed. In the Macau 2007 2nd Asian Indoor Games, WAKO Asian Kickboxing Federation has chosen to have competitions only in SEMI, FULL CONTACT and LOW-KICK.